Digital nomads are a 21st century counterculture. The choices they make today will shape how we live and work tomorrow. The center was not holding. But that was a good thing. It was a world caught in the fallout from credit bubbles, financial collapse and bank bailouts. Of Occupy protests on the streets of our cities and illegitimate wars that disappeared from the news cycle as fast as they had been invented to fill it. It was a world waiting for a recovery that would never arrive. Most of us were trying to pick up the pieces and put them back together as we remembered them being. But others were asking if the way things had been, had ever really been that great. There was a revolution in the air. We’d packed the world full of laptops, smartphones and iPads and stitched them all together with the Internet. The year was 2013, and our world was bristling with new technologies that were only beginning to fulfill their endless potential. There were seven billion people on the planet and for the first time we could all talk to each other as one global network. There was no rule book, and we were starting to realize that there never had been. Many smart, creative people were looking at the deal being offered and wondering what fool negotiated their side of the bargain. Students were quitting schools that wanted them to take on crippling lifelong debt. Graduates were saying no to unpaid internships that offered no promise of work. Skilled professionals were quitting jobs that wasted their creative potential. People were selling up, moving out and hitting the road, with only a backpack, a laptop, and a few creative ideas about how they were going to pay the bills. In the 30s they would have been called Bohemians. In the 50s Beats. In the 70s Hippies. Now it was 2013, and people were starting to call them ‘digital nomads’. At some point in mid-2013, I realised I was one of them. More and more of my working life fitted into my laptop. One day, I realized I could pack up the laptop, go anywhere in the world I wanted and take my work with me. I spent the summer in France and then decided I wanted to go further. The nomad network was buzzing about Chiang Mai, a small city in the northern highlands of Thailand, and the district of Nimmanhaemin, that had somehow become a mecca for digital nomads. I was writing a book, and because I could do it anywhere, I decided to do it there. I didn’t even know what I wanted to find, so I just stayed around awhile, and made a few friends. 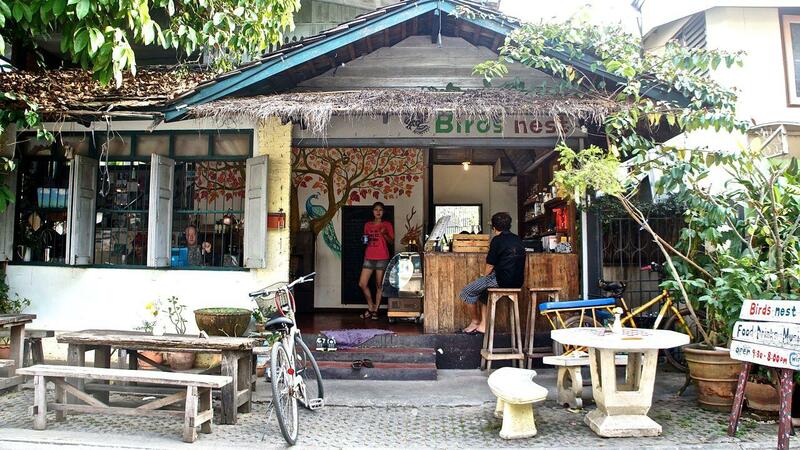 The Bird’s Nest cafe occupies a teak frame house on the edge of Chiang Mai’s old town. A hammock swings between two wooden uprights, bright sunshine filters through the Lanna style carved fretwork and fearless street cats weave among table legs, chasing speedy brown mice and yellow lizards. If you’ve ever daydreamed of freedom from your swivel chair in the cubicle farm, the Bird’s Nest is the place. The Bird’s Nest in Chiang Mai is a haven for “digital nomads” seeking a escape from the higher costs of living in Western cultures. I was on a tight deadline of my own making. It’s easy to confuse the life of a digital nomad with a never ending vacation but in reality combining travel and work means taking on all the stress and insecurity of freelance self-employment, while navigating a complex territory of time zone clashes, wifi failure, visa negotiations, and jet lag. I was drinking the strongest coffee I could find in bulk, anything to stay awake until I hit my word count, when Peter asked what I was writing. Explaining you’re writing about digital nomads when you are a digital nomad raises confusion. Was I writing about myself? Was I writing about myself, writing about myself? It turned out, I was writing about Peter. The Bird’s Nest is a haven for digital nomads, with a few dozen travellers passing through on most days, though the faces are never quite the same. They come looking for good internet, strong coffee and carrying Macbooks and iPads. Many are designers – of user interfaces, websites, graphics. There are photographers, video makers, and content creators. People who’ve realized they can take their work anywhere with an internet connection and that the unstable income of a creative freelancer stretches a lot further in Chiang Mai than New York. In the old city $1 will buy you dinner, $2 a large Chang beer, and for a $150 a month you can rent an apartment with a balcony, internet and laundry service. Peter is one such digital nomad. He works for an executive coaching company in Hong Kong helping market and sell their courses online. He’s training to deliver coaching himself, most of which is done over the internet. Top employees and executives are a valuable business asset, and the market to help them improve their strategic and leadership skills is booming. The work demands complex and subtle kinds of communication that once had to be delivered face-to-face. Now, it can be done over Skype allowing the best coaches to connect with the right clients anywhere in the world. It’s just one example of the unexpected kinds of work migrating from the physical world to online. But it wasn’t coaching that first brought Peter to Chiang Mai. At age 32, Peter, who is Anglo-French and switches fluently between English and French, had already travelled much of the world. The Thai’s call Westerner’s “Farrang”, a term leftover from the Frankish empire which had dominated Western Europe for much of the middle ages. For all that time, Westerners have been traveling to Thailand to learn about Buddhism. Peter arrived at a one of Chiang Mai’s numerous Buddhist monasteries simply looking for shelter, with no money and no home after years spend living in India. Arriving without any notice, or the traditional donation made by most visitors, Peter was fortunate the monks were merciful and allowed him a place on a month-long retreat. Twenty-eight days and nights of silent meditation opened his mind in ways he had never imagined. 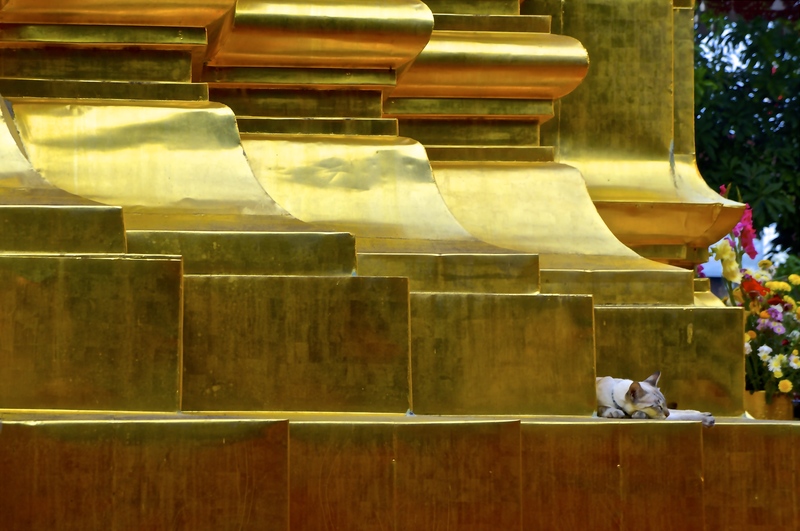 Cat sleeping at the temple of Wat Suan Dok. Meditation and yoga are remarkably common activities among the digital nomads of Chiang Mai and such pursuits are a part of Chiang Mai’s unique appeal to tourists and backpackers. But nomads aren’t on holiday or looking to discover themselves. They are working and this often includes long hours on creative but high risk projects. Making the leap to a nomadic lifestyle comes with unexpected stresses, the kind that arise from leaving behind friends and family to immerse in a foreign culture. For many nomads, meditation is just as an essential tool for accomplishing their work as a laptop. The most common reason people give up on nomadism, especially younger men away from home for the first time, is simple loneliness. Perhaps one reason why digital nomads often travel as couples. In March 2010, Simon and Erin sold their belongings and left the UK to travel the world. Like many successful nomads, they are slow travellers, staying in a location for weeks or months, enough time to allow them to focus on their work. Nonetheless, they have still managed to visit 30 countries in Asia, Central America, Oceania and other parts of the world. They tell the world about their journeys through the Neverending Voyage website, a popular digital nomad blog and the place I first read about Chiang Mai. I chat with Simon over fruit shakes. Average daytime temperatures in Chiang Mai push 30 degrees celsius even in winter, and there isn’t a street corner that doesn’t have a stand selling big cups of fresh fruit and crushed ice. It’s a far cry from the cold, grey Novembers of Britain that Simon and Erin escaped three years prior. The couple had an joint epiphany after returning to their jobs and home after a more traditional vacation. The trip made them realize that many of the things they had – a house and mortgage and traditional careers – simply weren’t making them happy. Simon was already working in web design, and so the pair took the leap to digital nomadism. 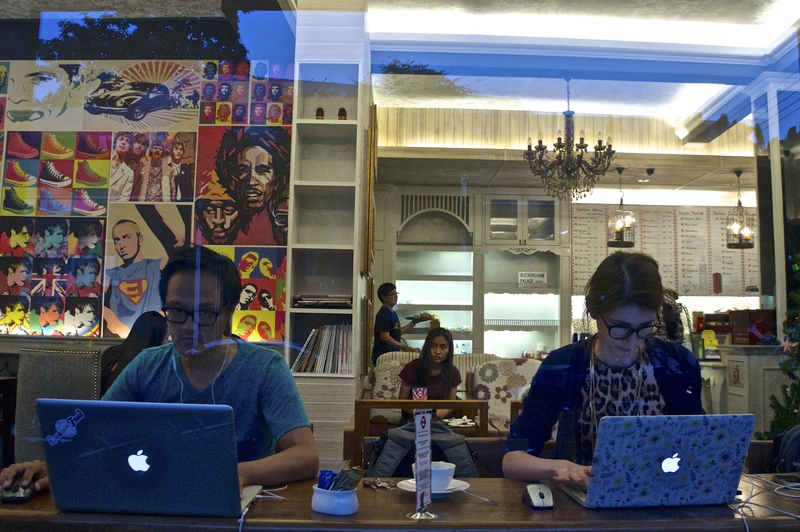 Digital nomads at the Marble Arch cafe, Nimmanhaemin. Like many who succeed in going nomad, Simon and Erin took to the road with both a healthy buffer of savings and a residual income from renting out their house in the UK. But they’ve worked hard to develop sources of income that can make their nomadic lifestyle sustainable for the longterm. Last year they released the Trail Wallet app for iPhone, to help travellers and nomads keep track of their essential expenses, and have continued with web design work. In their third year as nomads, they succeeded in breaking even for the first time. Simon, like all the nomads I’ve met in Chiang Mai, is a creator. He began as a musician, a drummer in rock bands and then channelled his creativity into digital design and coding. But he found creative fulfillment hard to come by in the corporate dominated, technocratic world where the work is often done for the profit of others. Successful digital nomads are people with the passion, skill, and creativity to achieve goals outside the prescribed structures and rules of a workplace. They are artists and entrepreneurs, people who thrive on freedom and creativity. They are people seeking places where they can have both, and today they are finding it in Chiang Mai. It’s that search for the sustainable creative life that has sent generations of creatives travelling to parts of the world where they can live cheaply and find fullfilment of their passions. In the 20s, it was the Montmartre slum district of Paris documented by Ernest Hemingway in A Moveable Feast. In the 40s, Jack Kerouac captured the Beat generation’s nomadic soul and the heart of the United States in his epic novel On The Road. In the late 60s, Joan Didion painted a vivid portrait of San Francisco’s hippie counter culture in her essay Slouching Toward Bethlehem. It is the same creative spirit that is now departing Europe and America as young creatives are displaced by gentrification and high costs of living. Now they come to Asia and the city of Chiang Mai, carrying laptops and smartphones, slouching towards the streets of Nimmanhaemin. In 2010, political unrest in Bangkok persuaded many digital nomads based in Thailand’s capital to look for a new home. Chiang Mai was a long an established stop on the backpacker trail, and had a small expat community of retired Westerners. The city’s remote location in the depths of Thailand’s populous but poor northlands gave little reason to think it would suit the needs of digital nomads. But Chang Mai was changing quickly, and no part of it more so than the Nimmanhaemin district, where the city’s prosperous middle class and young creatives were making their home. Those who arrived in Chiang Mai found a city in the first stages of an economic boom. Thailand’s left leaning Pheu Thai Party government had invested heavily in the infrastructure of the city between 2001-2006, which in turn attracted major investment from nearby China. By 2010, the city was positioning itself for status as a UNESCO creative city as part of its strategy for economic growth. Alongside the traditional wood-frame houses and tin roofed noodle bars of the city’s old town, a new wave of high end restaurants and luxury condo towers proliferated. The Nimmanhaemin district to the west of Chiang Mai was filling up with kooky coffee bars, art galleries, craft stores and fashion boutiques. The first nomads to arrive found a perfect location for slow travel, a city with an ultra low cost of living but an amazing culture of creativity. Word quickly spread through nomad blogs and forums and in the last three years increasing numbers of ambitious creatives have arrived in the city. Word-of-mouth is that there are 30,000 in Chiang Mai by late 2013, spread across the city among residences, guest houses, coffee shops, and a hand full of co-working spaces. Successful digital nomads are people with the passion, skill, and creativity to achieve goals outside the prescribed structures and rules of a workplace. 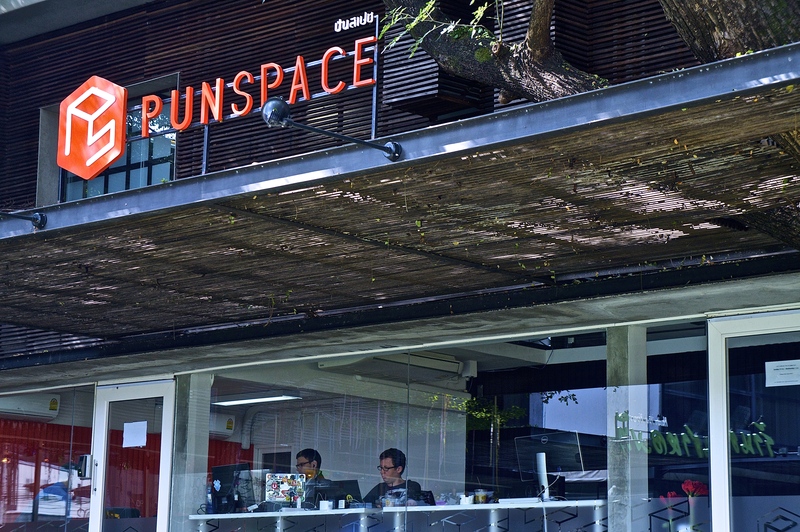 Punspace opened in early 2013 to accommodate the burgeoning population of digital nomads in Chiang Mai. It sits in a quadrangle of hip glass fronted boutiques and tea shops in a quiet corner of Nimmanhaemin. In the lingering heat of late November, a Punspacer stands stripped to the waist, balanced on a tree stump, sculpted abdominals rippling as he goes through a Ta’i Chi routine with martial discipline. His practice is exemplary of the digital nomad lifestyle of working hard and relaxing harder. Yoga, Thai massage, meditation, and athletic exercise as opposition to the tradtional backpacker activities of drink and drugs. Inside, the brightly lit shared space is solid with young professionals, predominantly male, focusing on their work in the oasis of air conditioning and high speed internet Punspace provides its members. Punspace, a modern co-working space in Chiang Mai is reflective of the burgeoning creative ecosystem that has descended on the East. “I’m out man,” says Adrian, a slighty-built, young American who, for the past two weeks, has been doing solid 12 hour days of coding at Punspace. He works with big noise cancelling headphones and sitting next to him, you can hear the tinny clash of techno music powering his fingers through line after line of computer code. His contract for a European tech start-up is up and he’s moving on from Thailand to Vietnam, an upcoming hotspot for digital nomads. There’s a jockish camaraderie among the Punspacers. But it disguises the basic transience of the digital nomad life. No one knows Adrian beyond small talk over lunch. Three minutes after he leaves, the space is silent again, excepting the bur of laptop fans and Adrian remains nothing more than a membership entry on the Punspace database. Coders are the bulk of the Punspace membership and some are contracted to major development houses who don’t care how or more importantly, where the work gets done. Others are navigating a richly rewarded freelance field so hungry for engineers that they can negotiate their own terms, including location independence. But also drifting through Punspace during my month long membership were film-makers, podcasters, web-designers and even a writer: Me. Among the punspacers there are many bloggers, content creators and SEO consultants whose main activity s writing. When I ask why they don’t call themselves writers I’m surprised by the answer – they don’t think they’re good enough and they fear being called out for not being “real” writers. The next phase of digital nomadism will not be lone adventurers with only a backpack and a laptop, but small companies and potentially entire industries relocating to parts of the world best suited to their business needs. Also gravitating to Punspace are an assortment of “internet marketers”, the broad catchall term for anyone with some web skills and something to sell. In many cases, the thing they are selling is advice on how to sell things. The bible of internet marketers is The 4 Hour Work Week by Tim Ferris. This handbook of “lifestyle design” advocates a system of digital outsourcing and automated business models to escape the “deferred life plan” of traditional 9-5 work. Like all persuasive sales pitches, there are nuggets of insight in the Ferris lifestyle manual. But there’s widespread skepticism amongst other digital nomads about Ferris’ ideas. The many internet marketers who have adopted Ferris as their gospel resemble nothing so much as a pyramid marketing scheme. The same same advice on how to make it as a digital nomad is repackaged and resold time and time again, for decreasingly small return, to those further down the pyramid. Kasper has lived in Chiang Mai for over two years now. He sees hundreds of digital nomads coming through Chiang Mai, but many never succeed in their ambition of establishing a location independent business. It’s not an easy goal to achieve, and Ferris’ dream of a 4 hour work week is very far from the reality. Kasper left Europe because he simply couldn’t see opportunities there for young entrepreneurs like himself. With his partner in Sao Paolo, he owns a development company that specialises in online services, many of them tailored to the needs of digital nomads and mobile businesses operating internationally. 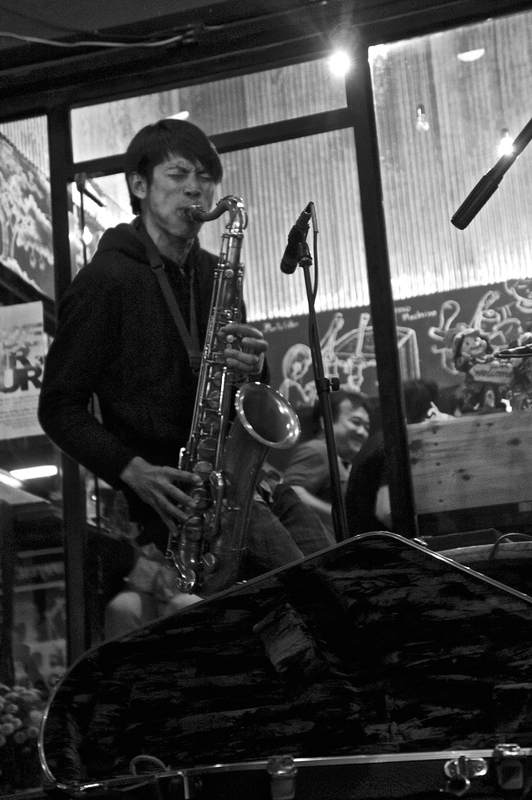 We’re talking in the Warm-Up Cafe, a buzzing nightspot in the heart of Nimmanhaemin. Nimman Road is a unique blend of traditional Thai style, European chic, and a retro 1950s Californian vibe. The college kids who party here are obsessed with motorbikes, 90s grunge music and hipster culture. In 2013, hipster students look the same the world over – skintight low-slung jeans, asymmetric haircuts, tattoos. Nimman at night could be London’s Soho, Saint-Germain in Paris or the Mission district in San Francisco. And in a decade it will likely be as exclusive as those neighbourhoods. An apartment in Nimmanhaemin today costs 30% more than it did just a year ago. Kasper has agreed to introduce me to Edmund, an American entrepreneur who now makes his home in Chiang Mai. Edmund has taken advantage of the boom in Chaing Mai, helping businesses set up shop in Thailand, a process that can be bureaucratic and labyrinthine for new entrepreneurs in the country. He helps new businesses establish a legal structure, and can even manage ongoing work permits and permissions for employees. 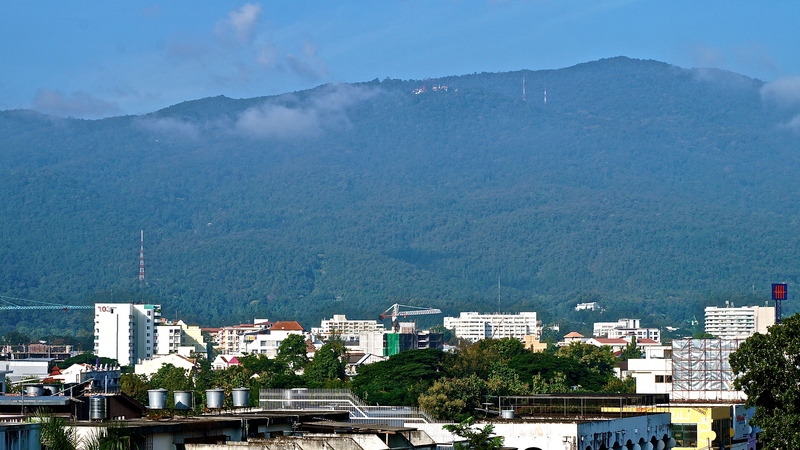 Chiang Mai is a potential mecca for tech start-ups and creative businesses. The next phase of digital nomadism will not be lone adventurers with only a backpack and a laptop, but small companies and potentially entire industries relocating to parts of the world best suited to their business needs. Skilled professionals can be tempted to work here for a third of the pay because they can achieve a much higher standard of living in Thailand’s northern capital. Cities like London, Paris, New York, San Francisco and other cities that have priced themselves out of the reach of most young people could see a shock exodus of the very creative professionals on which their fortunes are founded. However, there are still a few barriers to Chiang Mai’s potential transition to a startup hub. The lack of a physical base in traditional centres of capital like San Francisco, New York or London is still a deterrent to many investors. Such traditional perceptions take time to change, but changing they are, not least because a small start-up operating at half the cost of its competitors has a massive commercial advantage. The rise of platforms like Crowdfunder, an “equity crowdfunding” version of Kickstarter that allows backers to actually invest in and receive a return on projects, has the to potential to radically democratise where new business emerges. The looming, holy mountain of Doi Suthep is a place of pilgrimage for foreigners visiting Thailand and the Chiang Mai province. The holy mountain of Doi Suthep imposes over the bustling streets of Nimmanhaemin, and the golden minarets of the Wat Phra That temple sparkle in the relentless Thai sun. Young monks in the traditional orange robes of the Thai buddhist tradition walk alongside young hipsters. Ancient temples stud the old town of Chiang Mai, rubbing shoulders with the glass and steel of condo towers and shopping malls. But it’s not complete coincidence that brings a generation of digital nomads to an ancient capital of Buddhism. For two and a half millennia, Buddhism has been challenging people to climb the holy mountain and take part in spiritual retreat. The thirty days and nights of silent meditation are a serious challenge. Few Westerners conditioned to our culture of constant activity and stimulation can deal with silence with only their thoughts for company. But it’s in the silence of meditation that life’s hard questions are answered. For today’s digital nomads, the question is whether their travels are only taking them back to the material culture of the West, or towards a different kind of life. But digital nomadism is not a life for everyone. The freedom and creativity that make it exciting for artists and entrepreneurs also comes packaged with exactly the risk and and insecurity that most people seek to avoid. As humans we’re conditioned to seek security in our relationships and connections to each other, in friends, family, and tribe. As nomads, we give up that security in exchange for the freedom to find ourselves as individuals. The counter culture of the 60s liberated a generation from the conservative social values of their day. Today’s counter culture is changing our relationship to where we live and how we work. We’re a generation freeing ourselves from the assumption that a 9-5 life and a crushing burden of debt are the only kind of life. Instead we’re seeking better, more creative ways to live. We’re finding ways to use technology instead of being used by it, ways to be liberated by our inventions, not trapped by them. In a decade, we will look back on digital nomads as pioneers of a lifestyle so widespread that it no longer requires a name. Walking the streets of Nimmanhaemin I wonder why I came to Chiang Mai. Was it to write a book? Or was I seeking something else? Looking up at the holy mountain of Doi Suthep, I think I might climb it myself, and find my own answer. Damien Walter is a writer of both fiction and non-fiction. His work has appeared in Wired UK, SFX, i09, Aeon, and Electric Velocipede. He teaches creative writing at University of Leicester and writing for digital media at University of Nottingham. First published in The Ascender magazine. Nearly half a year ago I stuffed my life in to a backpack and my work in to a laptop and set out on the road as a digital nomad. It’s been a wonderful and intense five months, and time enough to learn a little about how working and travelling combine, and why so many people today are choosing this lifestyle. At the moment I’m in Chiang Mai, Thailand which has become the unofficial capital of digital nomadism. It is an amazing city and one I’ve already written about and will no doubt write about more. In just a week here I’ve already met dozens of other digital workers based in the city. They’re a diverse group from all corners of the world, most in their 20s or 30s, many running successful online business, others building their’s from scratch as they travel. But all of them seem to share three core qualities that are the foundation of this lifetsyle. Creative – It might go without saying that people who choose to travel and work around the world are creative. But it’s creativity in the broadest sense. At the co-working space in Chiang Mai where I turn up daily, the membership board lists coders, entrepreneurs, bloggers, podcasters, marketers, writers, and an array of other roles that can follow their owner wherever they travel, with the right technology and a good internet connection. All of the digital nomads I’ve met are building, making and creating, be it a new book or a new business. Having a clear creative focus for your travels is an essential part of digital nomadism. Interdependent – Going nomad requires a high level of independence. Getting on the road means leaving behind family, friends and all things familiar. But being on the road needs more than independence, it demands interdependence. Co-working spaces are at the heart of digital traveller communities because they put you in instant contact with an extended group of your peers. These are people you can talk to, learn from, and share your experiences with. Choosing a city like Chiang Mai, with a high concentration of expats, digital workers and creatives is an extended version of the same thing. It’s essential to think through how you connect with other people as you travel, and not allow travelling to become long term isolation. Minimalist – Living out of one backpack enforces minimalism. But there’s also a common pragmatic minimalism among the other digital nomads I meet. People have the items and technology they absolutely need or want, because part of the appeal of nomadism is not being weighed down by possessions. In the words of Chuck Palahniuk, “The things we own end up owning us.” Some digital travellers are making small or even large fortunes from their businesses, but still have the same laptop they did when starting-up. Travelling and finding new experiences aren’t helped by having a lot of stuff. Buying and owning as much as you can is still hardwired in to most of our culture, but it might be one of the things you go travelling to unwire yourself from. I’ve been asked a number of times now how I went about preparing to work and travel together. I think these three core qualities suggest three kinds of questions as a first step. Do you have a creative ambition that you want to fulfil? Are you happy saying goodbye (temporarily!) to old friends and open to making new ones? Can you let go of things and replace them with experiences? If you’re saying ‘yes’ to these questions, you might even be on your way already.